Morocco has a long, rich history that today lives on in traditional arts and crafts. The native Berber culture has been influenced by so many cultures that have left their mark on the area: Arab, Jewish, Andalusian and French. If you travel to Morocco, Fez and Marrakech are must-see cities and home to many artisans who make typical Moroccan arts and crafts. 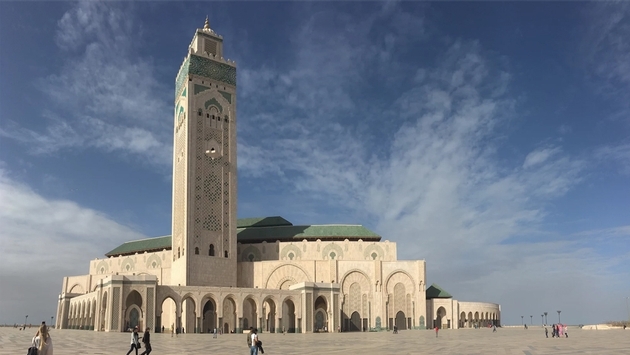 Tours like Intrepid Group’s North Moroccan Adventure Tour make sure you get a good taste of their historic medinas, which are the older, walled and maze-like parts of town. Within these walls, merchants sell all kinds of goods and craftsmen sell their products. Seeing them being made is as uniquely Moroccan as you can get. Technique generally adheres to guild traditions where masters pass their trade down to apprentices, even father to son through many generations. Today the survival of crafts depends on tourists and foreign support; and oftentimes tour groups may have deals with certain shops they take their customers to. In the end, you can rest assured knowing that you get authentic Moroccan souvenirs. There’s no escaping the beautiful tile work that exists all throughout Morocco. Much of the architecture is Moorish design, which consists of three elements: stucco, painted and carved cedar wood and mosaic tiles, called zellij. One of the most impressive examples of mosaic tilework exists in Casablanca, in the Hassan II Mosque. Other ceramics famously made in Fez utilize the local fine red clay. They are still hand painted and assembled by skilled craftsmen. Workshops are open to visitors who wish to watch and see the ceramic making process. The largest and oldest leather tannery is in the medina of Fez, called Fez el-Bali, and is pushing a thousand years old. 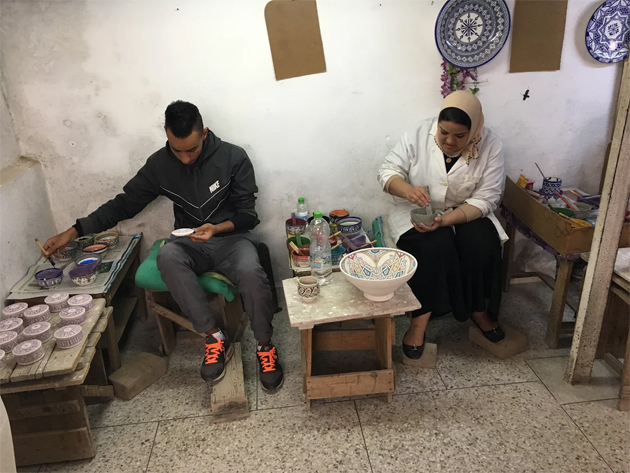 The tradition of Moroccan leather-making is well established, and was even featured in an episode of the Amazing Race during season 25. Vessels are filled with mixtures that make the hair and other excess parts of the hide easy to remove. Then they are soaked in another mixture containing pigeon poop that prepares the hide for dyeing. All the work is done by men who knead the hides with their feet to soften the leather. The hides can be dyed a variety of colors, and still resist synthetic materials by sticking to natural dyes. Metalwork is prominent in Moroccan architecture on doors and windows as elaborate decorations on hinges, knockers, knobs and grills. Other workshops make items for the home out of brass, silver and pewter. A big purchase for any Moroccan family is a teapot, which should be of such good quality one is enough for a lifetime. They can be as elaborately decorated as one wishes, and used daily to serve the Moroccan favorite, mint tea. The Berber tradition of rugs is over 2,000 years old. Each one produced is unique, and traditionally hand-made by women. Traditionally, rugs represent a story that is never finished. This is expressed through the tendency to have fringe only on one edge. The opposite side won’t have fringe because it represents the continuation of time. Just like with leather, the dyeing materials are usually natural and remain so to this day. 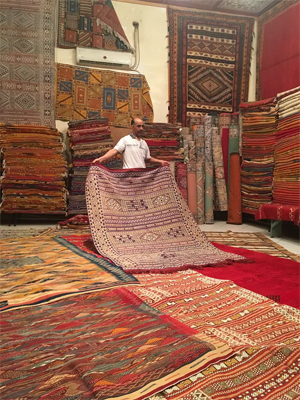 Rugs are very popular as collector’s items for tourists. The Moroccans are known for a number of other goods as well, including textiles and jewelry. Additionally, each city may specialize in its own craft or version of a craft that makes it unique. There’s no way to leave Morocco without some genuinely special souvenirs.